In 1868 the Biologist and father of popular science, Thomas Henry Huxley gave a lecture On a Piece of Chalk to the ‘working men’ of Norwich. In an ordinary lump of white rock, taken from the landscape beneath his feet, Huxley discovered the existence of oceans and life forms now extinct. Here, in the soft, compressed temporality of chalk, Huxley found not only the history of the world but the ‘substance of the universe’. 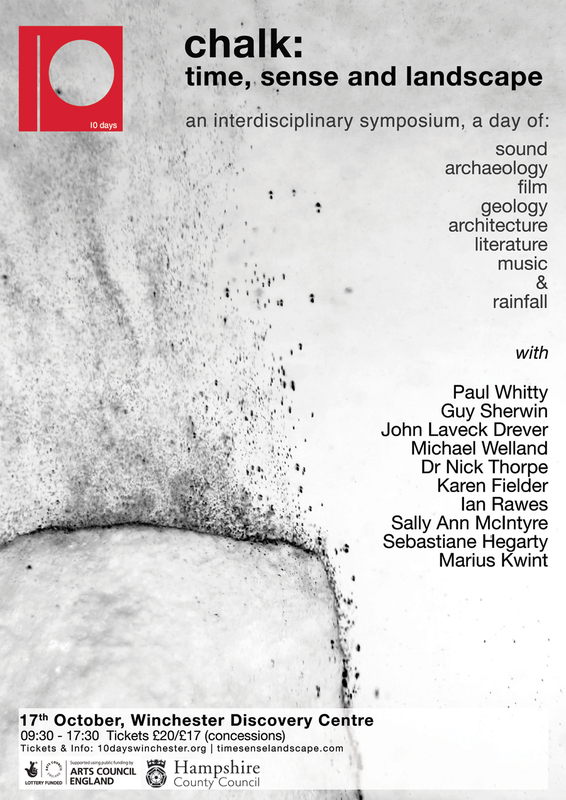 As part of the city wide arts event, 10 days 2015 CHALK, this innovative symposium takes inspiration from Huxley’s paper, bringing together prominent figures from the arts, music, literature and science to uncover landscapes beyond and beneath the visible. Having learned of the recent sad death of keynote speaker Emeritus Professor John M. Hull, we would like to dedicate this symposium to his memory. The day will begin with a showing of the award-winning documentary Notes on Blindness, based on John’s audio diaries of his journey into blindness. The symposium will promote a dialogue between the senses and across disciplines, offering an exploration of landscape from distinct areas of study. In an eclectic mix of academic papers, sound performances, film and expanded cinema, the unique programme of contributors includes: Prof John Levack Drever (Sound Artist); Prof Paul Whitty (Composer); Michael Welland (Geologist/Author); Guy Sherwin (Film Artist); Dr Nick Thorpe (Archaeologist/Author); Ian Rawes (Field Recordist/London Sound Survey); Dr Karen Fielder (Architectural Historian/Conservationist); Sebastiane Hegarty (Sound Artist); Sally Ann McIntyre (Radio/Sound Artist) and Marius Kwint (Cultural Historian/Curator). Chalk: time, sense and landscape, is open to everyone and is supported by 10 days Community Interest Company, Arts Council England and Hampshire County Council. It will take place on Saturday 17th October 2015 at Winchester Discovery Centre. Tickets are £20 (Concessions £17) and are available for purchase from the end of July.